Professor: Who has written this kīrtana? Narottama dāsa Ṭhākura's singing, hari hari biphale janama goṅāinu: "My dear Lord, I have simply wasted my time, biphale, without any profit. Because I got this human form of life, but I missed the opportunity for worshiping Rādhā-Kṛṣṇa." Manuṣya-janama pāiyā, rādhā-kṛṣṇa nā bhajiyā. "And by doing this, I have taken poison knowingly." Jāniyā śuniyā biṣa khāinu. Then, golokera prema-dhana, hari-nāma-saṅkīrtana: "This nāma-saṅkīrtana is not any material thing. It is the ecstatic love of Kṛṣṇa in the Goloka Vṛndāvana." "But I have no attachment for this hari-kīrtana." Biṣaya-biṣānale, dibā-niśi hiyā jwale: "My heart is always burning in material existence," tore bāro na koinu, "but I did not make any means by which I can get out of it." Brajendra-nandana jei, śacī-suta hoilo sei: "Formerly, the same Personality of Godhead, Kṛṣṇa, who was, who appeared as the son of Nanda Mahārāja, He has again appeared as the son of Śacīdevī." And balarāma hoilo nitāi, "And Balarāma has appeared as Nityānanda Prabhu." "I have no other shelter. Don't kick me." There are many very appealing songs in Vaiṣṇava literature. "This prayer is offered by Narottama dāsa Ṭhākura, a great ācārya of the Vaiṣṇava sampradāya. He is saying for himself, 'My dear Lord, don't kick me away.' Narottama dāsa kahe, nā ṭheliho rāṅgā pāya: 'Don't kick me away. Accept me in the service of Your lotus feet.' Tomā bina ke āche āmāra: 'I have no other shelter than Yourself.' This is the sum and substance of all prayers. If you submit to the Lord that 'I have no other shelter than Yourself,' then He takes at once charge of you. But if you think that 'My dear Lord,' or 'My dear God, I come to You for my daily bread, and as soon as You give me my daily bread, my business is finished with You...' No. That is also very good, but this is not love. This is business. The Kṛṣṇa wants lover not for any business." This position is very nice, niṣkiñcana. 'I have lost everything. I am now not cared by my family, my friends. So everything I have lost. Therefore I am forced to come to You, surrender. So don't kick me, kick me out. Please give me shelter, because I have no other shelter.' Tomā bine ke āche āmāra: 'There is nobody else to take my care except Your Lordship.' This is called niṣkiñcana. So actually that is the position. So long we shall think that 'For my protection, this arrangement is there for my protection. This arrangement is there,' that is not niṣkiñcana. Niṣkiñcana means when I'll think..., I'll be actually under the understanding that 'I have no other protection except Kṛṣṇa,' and then I fully surrender, that is the best qualification for Kṛṣṇa consciousness. Therefore it is said, naivārhaty abhidhātuṁ vai tvām: 'Unto You.' 'Who are You?' Akiñcana-gocaram: 'You can be understood only by a person who has lost everything.' Who has lost everything." This position, that 'Kṛṣṇa, except Yourself, I have nothing to claim. I have nothing, no possession. So don't neglect me, because You are my only possession.' This position is very nice. When we do not depend on anything material, simply depend on Kṛṣṇa, that is first-class position of Kṛṣṇa consciousness. Therefore Kṛṣṇa is addressed: akiñcana-vittāya. 'When one becomes impoverished materially, You are the only wealth.'" "So here also, Narottama dāsa Ṭhākura prays, 'My dear Lord Kṛṣṇa, You are now present before me with Your internal potency, Your pleasure potency, Rādhārāṇī. So I am surrendering unto You.' 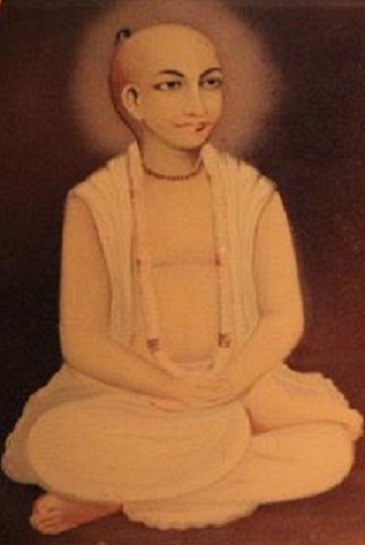 Hā hā prabhu nanda-sutā. 'Don't neglect me because I am so sinful, my past life is so black. Don't neglect me. Please accept me. Don't kick me away. I surrender unto You.'"